Metallic hang tag printing is a process where silver ink is applied underneath regular colors. This results in hang tags that glisten. Unlike in foil printing, a metallic finish can be applied to a wide range of colors, leaving you with more creative options. Metallic print hang tags make use of 16 pt. cardstock, one of our thickest materials. Make your printed metallic hang tags look even more special by adding spot UV. This special coating is applied to specific areas of your design that you want your customers to pay extra attention to. 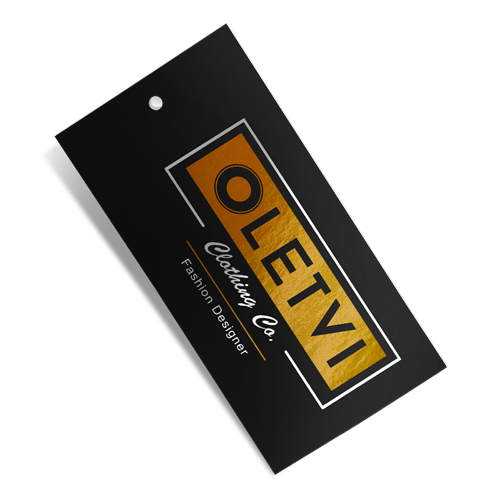 We offer square and rectangular full-color metallic hang tags, with square being the most popular shape. Here’s a list of all the sizes we offer. There are coating options you can add on top of your metallic hang tags to add a layer of protection against dust and moisture. See our hang tag marketing tips for helpful information on how to get started. Is turnaround time the same as shipping time? No. Turnaround time simply refers to the number of business days it takes to print metallic hang tags. Shipping time is not included. What’s the difference between UV coating (UV both sides and UV front) and spot UV? Spot UV is applied to a specific part of your design to draw attention to details. UV coating is applied to the entire hang tag. Can spot UV be applied to any part of my design? Yes. However, we strongly advise that the font size be at least 9 pt. to see the full effect.